How wonderful to meet and fellowship with blogger friends. Love your teacup and I'll take peanut butter anything anytime! Oh Kitty, you have been having too much fun! First of all I love all your bunnies! And those cute critter treat jars are adorable! Your peeps cookie cake turned out perfectly, and those chocolate eggs, my oh my! Love the new tiered stand too. Blogging friends are indeed special, how fun to meet for lunch. I hope you have a wonderful Easter! So many great things in this post. The peanut butter Easter eggs look like a very special treat. Your grands did a great job with the peeps cake. How fun to meet Deborah. I've enjoyed meeting a few bloggers - such a great community. Happy Easter, Kitty. How nice to have some quality one on one real time with a blogging friend. I don't know Deborah, so I'm off to visit her blog and introduce myself. Love making a new friend. Hi Kitty, one treat after another! What fun you've had. The critters are too cute and I'll check out the link (think you). Peanut butter and chocolate -- be still my heart!!!!! I love your handmade bunnies and you and the gran-kids did a great job on the cookie tart. You are just having too much fun! And you got to meet a fellow blogger -- another treat! Happy Spring and Happy Easter! Oh, Kitty, it was so great to meet you, and I had a wonderful time! I am getting ready to take a nap right now, the weekend was so busy, but I had to stop by first! Hi Kitty! Oh, what a beautiful tiered stand you have and it looks lovely with the cupcakes on it! Your did good on your copy cat from Linda. I saw those too and thought I need to do this, but I didn't! :) The big Peep cookies is so cute and the kids look very proud of themselves. Happy Easter and I hope you're doing well. How cute everything is, Kitty. I love the little jars, and the peeps cake is adorable. How fun your Grands must have spending the night with you! Also love the handmade bunnies you bring out each year. Happy Easter! What a wonderful tiered tray. You will get lots of use out of that. Those Easter eggs look delicious and the jars are adorable! You're so funny saying you 'amputated' them. Had to giggle at that. I'm so happy you got to spend time with Deborah. I bet you two covered a lot of ground with your chat. Lovely for both of you. Happy Spring, my friend, and enjoy your week. I look forward to Mondays to vist here! Those jars are too cute. I love this post. Pretty setting, cute people and yummy food. How do I love this post? 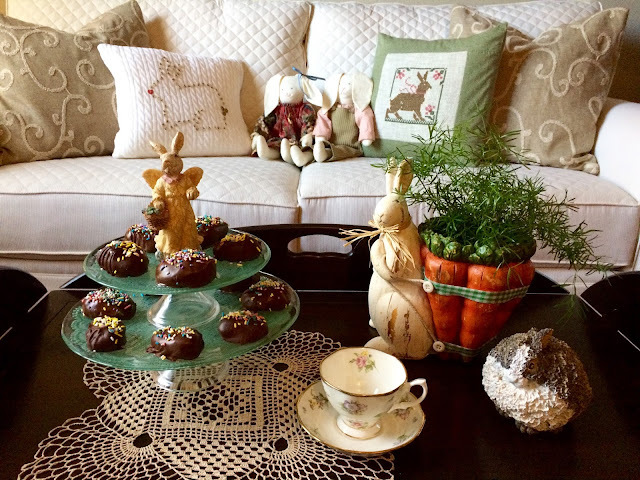 Let me count the ways: 1) chocolate peanut butter treats; 2) teacup with pretty purple flowers; 3) adorable bunnies and grandkids; 4) a meet-up between 2 bloggers I greatly admire! As a huge Toy Story fan, I would have felt bad cutting up the stuffed critters too. Heh. Kitty, Happy Spring! I clicked on your PB egg recipe and YUM! I don't know if I will have time this year to make them but I will definitely make them next year. Your spring decor makes me smile. Too cute that you had to amputate the furry friends. Did you at least anesthetize them? And how sweet to meet a blog friend. Both of you are lovely ladies! This post is filled with so many lovely things. I love your treats and I would enjoy one with tea with you. What a sweet gift, the doily embossed tiered cake stand and how pretty is the tea cup! Adorable bunnies and furry critters. Your grands are adorable and I know you must have enjoyed this evening Kitty. And, it is always a wonderful thing when we can meet our blogger friends. 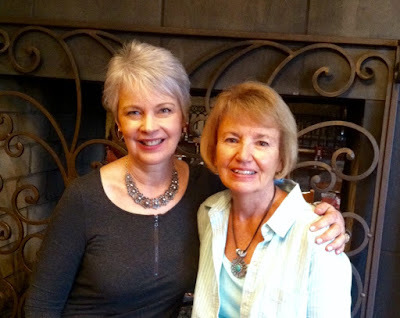 Enjoy a Blessed Easter………..
Oh what fun to see two blogging buddies together! It is always fun! Glad that you carried on like old friends, which you really are! 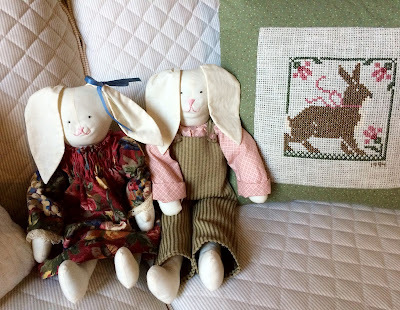 So much Easter goodness going on here...love your projects with the grands right down to the surgeries of little critters...LOL! Thanks for popping in today, Kitty. I don't know how long it would have taken me to realize that your blog was one that had been bumped. Blooger...harumph. Such a delightful meeting with Deborah! I happened to meet a fellow blogger this week myself, and it was quite the amazing experience, we just happened to be in the same restaurant at the same time, amazing! A God thing for sure! Your little easter treats are just delightful, cutting them up would certainly feel a little funny for sure, but they turned out so cute! I hope you have a blessed and very special Easter, dear Kitty! Your Easter treats look scrumptious. 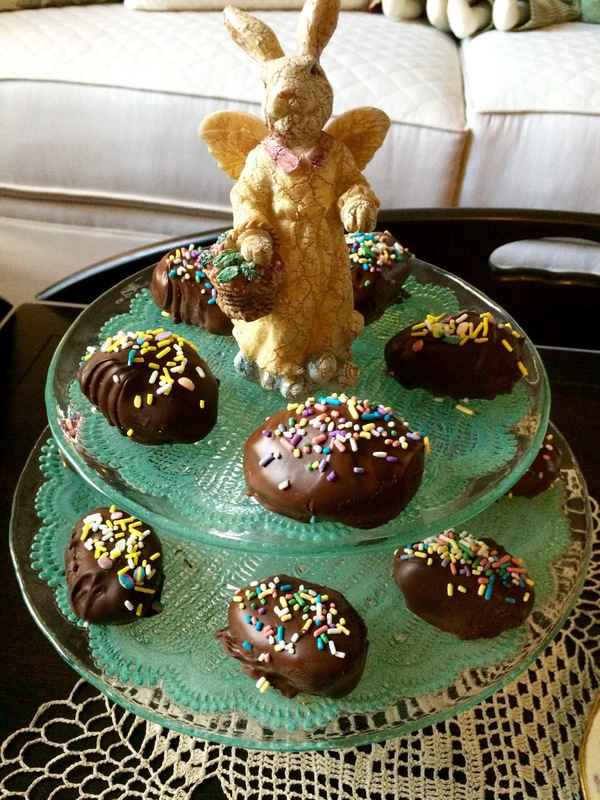 You grand-kids did a wonderful job in whipping up those bunny treats. I do love the two tiered cake plate...love the embossed doilies. Pretty tea cup also, it definitely heralds Spring. How wonderful to meet with Deborah; it sounds as if you are kindred spirits. May you have a blessed Easter, Kitty, with your family. Hello Kitty, I love all of your cute Easter inspiration you have shared with us at Cooking and Crafting with J & J. How exciting to have been able to meet Deborah and I bet she is just lovely meet and I enjoy her blog too. Wishing you a wonderful week and a Happy Easter. Everything is so perfect for Easter and your sweet grandchildren steal the show! HI Kitty, your home looks so lovely decorated for Easter! 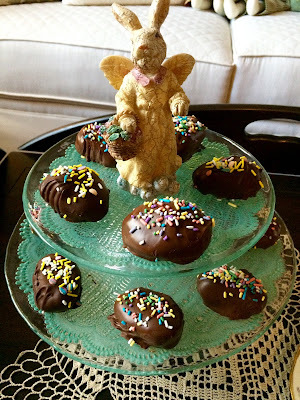 I use to make the peanut butter eggs years ago, I think I need to make them again! Your grands are so darling! I know mine are a life saver to me since my dear daughter passed away. How wonderful to meet a blogging friend! You both are so beautiful! Happy Easter to you and many blessings too! Your chocolate eggs look so good and I just love your bunny couple and the cute little collection of bunnies with the jars.... I bet your grandkids enjoyed creating the fun easter treat with you! Yum, I like the looks of those chocolate eggs! Your grandkids did a wonderful job on the tart! I am impressed with the piping! 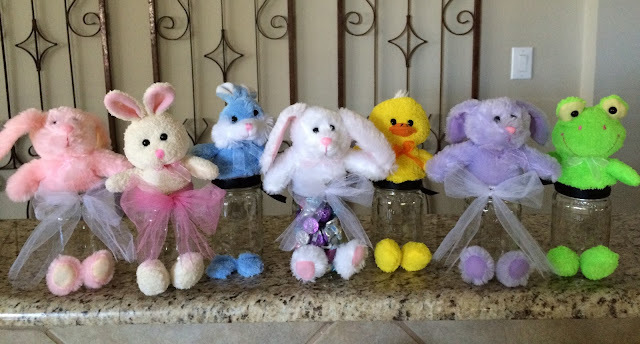 And the animal jars are just the sweetest Easter craft and gift for kids! Really cute Kitty!! Another meeting of bloggers! How nice that you got to meet Deborah! Wishing you a lovely Easter Kitty! I am so glad you and Deborah got together. 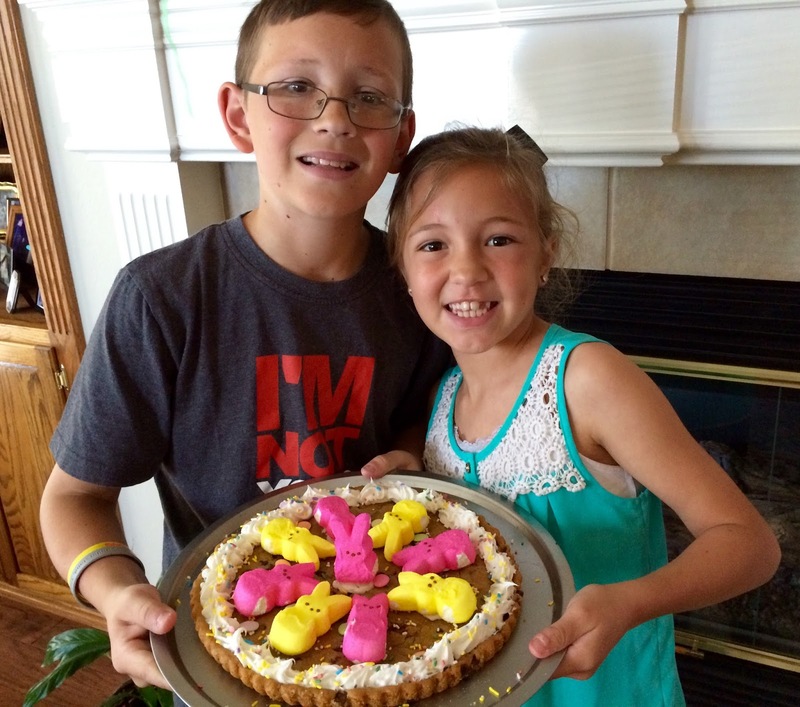 I also enjoyed this darling posting with the grands and your fun cookie tart. Looks like they sure loved doing this with Grandma! So glad you shared and linked Kitty. Have a lovely week. Everything is just so cute! I love when I meet blog/Instagram friends. I clicked right over to those peanut butter Easter eggs. I have a similar recipe for what I call Buckeyes. I think I'll give your recipe a try. What a fun time you must have had with your grands & that cookie! Also getting to meet up with Deborah had to be a joy as well. I'll have to check out her blog today. That two piece tiered plate stand is just lovely, esp. with those yummy looking choc/peanut butter eggs on top! I am always so impressed with how you can set up a little area to look so inviting. I need to work on doing that. Have a Blessed Easter, Kitty, surrounded by the love of family & friends. Your home looks lovely and your grandkids look very happy! Have a wonderful Easter. There is nothing better than grandchildren , their visits, and a special holiday. Each time I visit here Kitty, you warm my heart. The furry critter jars are adorable. I used to have a very similar pair of bunnies until the Boston terrier we had for many years adopted them as his bed partners. How sweet that you got to meet another blogger. The jars are adorable....such fun. So glad you enjoyed your time with another blogger....and the grands did an awesome job on the cookie..
All is so wonderful! Sweet grandchildren!I love your beautiful Easter decorations! Oh Kitty those peanut butter chocolate eggs look SO good! Glad you got to meet a blogging friend. That's so special. This is such a fun post. Your sweet grands, the cake, the egg, that gorgeous tea cup, blogger friends and furry critters. My, you have been busy, Kitty. Happy Easter and Happy Spring Kitty! I am so glad you had your grandkids over. They did a great job on that dessert. 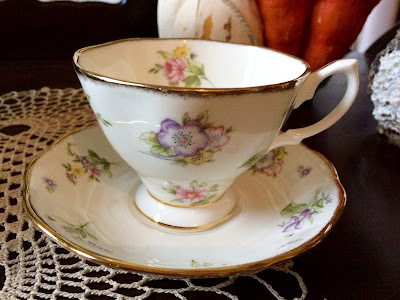 That is a very sweet Royal Albert vintage cup! Wishing you the best day and a lovely springtime. Happy Easter, precious friend! As I type this I am listening to the song "Roll Away The Stone" :) I was not familiar with it so I had to find it right away - I love it! I hope your Easter is off to a beautiful start. My little one and I have a cold so we did not make it to church and I must confess that I am heartbroken! How I love the Easter service and the glorious songs that we sing. I was also to play a special on the piano...but I keep telling myself that God knows and has a plan even with something like this. Your song came at the perfect time and has greatly encouraged me - thank you! Your post is simply lovely and that tea cup...STUNNING! And speaking of stunning, you and Deborah are so beautiful! I am so glad the two of you were able to meet up.